It's safe to say that highlighting completely blew up in 2015, leaving the majority of us wanting to look like we've bathed in glitter every day. Albeit highlighters are wonderful in all of their variations, they can often be pretty expensive and rack up quite the credit card bill. With brands such as Hourglass, Anastasia Beverly Hills and Becca releasing cult classics in the high end highlight game, it's less common, to me anyway, that I find any budget highlight options that perform like the pricier products - until now. 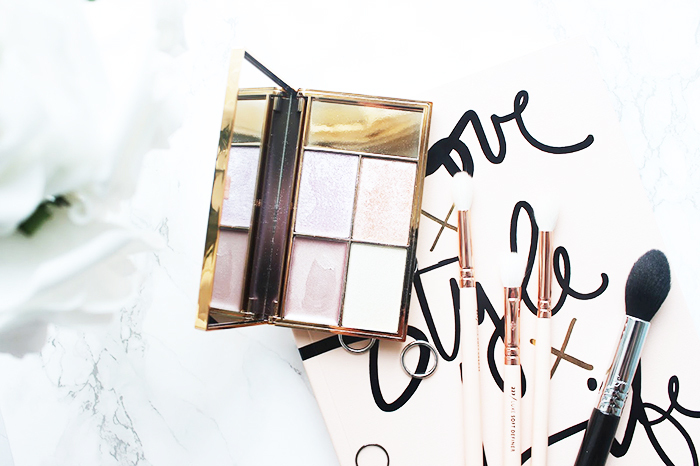 *Drum roll please* I introduce to you, the Sleek Makeup 'Solstice' Highlight Palette! The first thing that caught my attention with this palette was the beautiful rose gold packaging; I really am a sucker when it comes to packaging, and anything in the copper and gold category is a clear win for me. The Solstice palette contains three powder highlights (subsolar, hemisphere, equinox), and one cream shade (ecliptic) making it ideal for layering. Two out of Three of the powder shades, Hemisphere and Equinox, are a baked formula with undertones of lilac and orange; these give the most beautiful iridescent glow to the cheeks, and the coloured undertones provide the most interesting reflect in the light. When I use this palette I actually love to mix all three of the powder shades, I find this creates the best glow with the most colour payoff; you really can just tap the brush lightly and get great payoff with these powders though, as they're so bloomin' pigmented! Overall I've fallen head over heels for this palette. From the packaging to the product itself, Sleek have mastered this one down to a T. The shade names are extremely beautiful and ethereal, Sleek truly have done such a great job in creating shades that are not only great at highlighting (duh), but are individual and stand out from colours I've previously come across. This particular palette retails for only £10 which to me, is crazy. My expectations were completely surpassed and this has become a staple in my collection, I can't wait to try more from Sleek. Have you tried this palette? What are your favourite highlighting products?